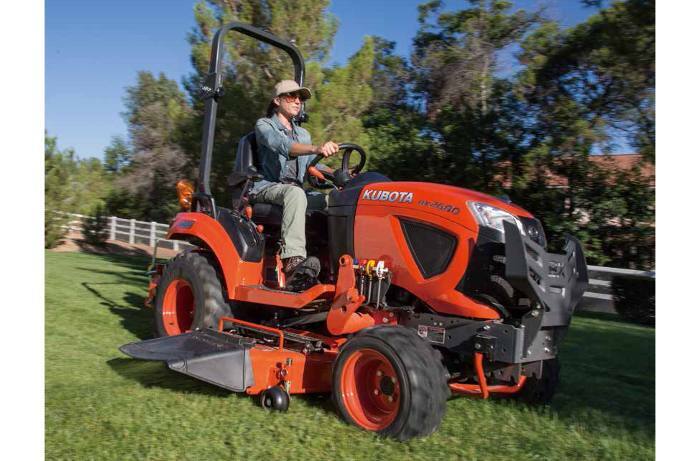 What Can You Do With A Kubota Sub-Compact Tractor? Attach a large assortment of implements with the standard 3-point rear hitch: Level ground with a box blade; Till a garden with a tiller; Mow a pasture with a rotary cutter; Dig post holes with a post hole digger; And much more! 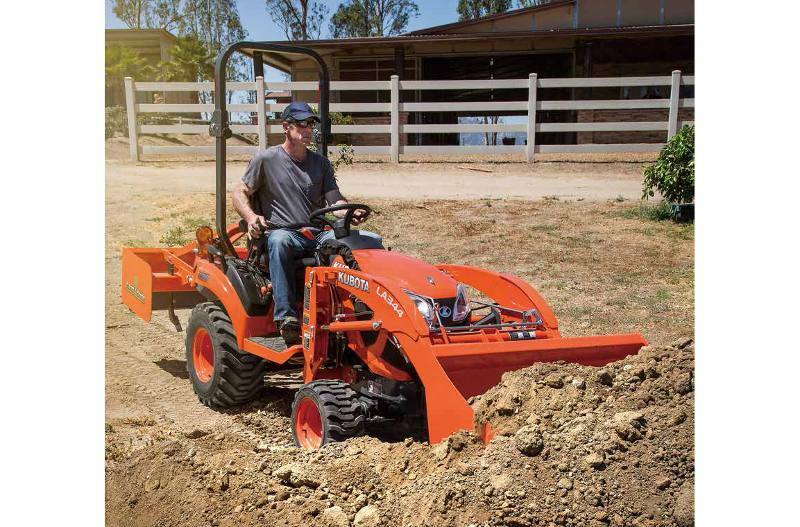 All of these features allow a sub-compact tractor to be more versatile than a lawn tractor, but more maneuverable and user-friendly than a compact tractor. Front Turf/Bar/Industrial: 16×7.5–8 / 16×7.5–8 / N.A. Rear Turf/Bar/Industrial: 24×12–12 / 24×12–12 / N.A. 4-Point Front Hitch - Clear the Way With Ease: Do you need to clear snow, sweep your driveway, or dethatch your lawn? 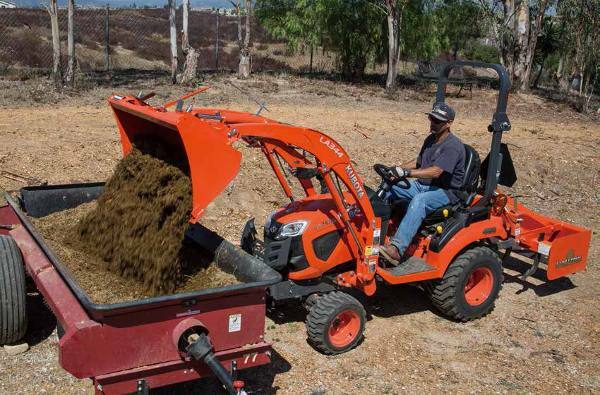 The Kubota 4-point front hitch enables front implements like blades, brooms and snow blowers to be easily attached and removed, making the Kubota BX80 even more versatile! Swift-Tach Loader - Remove Your Front Loader in Less Than 60 Seconds: Why would you ever want to remove your front end loader? One good reason is that removing the front loader helps prevent ground compaction and turf damage when mowing. It also reduces your turning radius when working in confined areas or around trees. In fact, you'll find that there are plenty of times that removing your front loader will make your job quicker and easier. That's why it's so important that the BX80 series front loader can be removed quickly, without leaving the operators station. Not only is the BX80 front loader easy to remove, it also has the following premium features- Single Lever Hydraulic Connection - Simultaneously attach and detach all four front loader hydraulic lines; Premium Flat Faced No-spill Hydraulic Couplers - Less mess and easier to connect than traditional tractor hydraulic couplers; Curved Boom Design - Allows for better visibility when performing front loader work; Optional 2-Lever Quick Coupler - Easily connect to a wide variety of front loader attachments, such as blades and pallet forks; Optional 3rd Function Valve - For attachments that require hydraulic power such as grapples; Optional Bucket Level Indicator Rod - Helps maintain a level bucket, making material handling even easier. Lower ROPS - Storage Has Never Been So Convenient: Planning on storing your new BX1880, BX2380, or BX2680 inside? The new lower ROPS makes that easier than ever! With an overall height of less than 7', these units fit through most standard garage doors without folding. Making everyday storage quicker and easier. Quality And Durability - Engineered And Built By Kubota, For Kubota: Looking for a long term investment? The BX80 Series is designed with strength and longevity in mind. Combine that with excellent resale valve and you can be sure the Kubota BX80 Series is the right choice. Kubota Diesel Engine - Kubota is the #1 manufacturer of under 100 HP non-automotive, multi-cylinder diesel engines in the world. Kubota Designed, Kubota Built - Front to rear, the Kubota tractor is designed and built by Kubota for our Kubota customers. 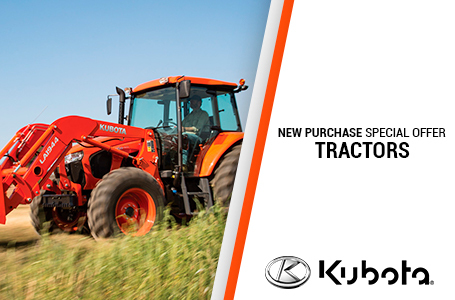 You won't find a "Kubota" re-branded tractor built by others, only Kubota quality through and through. 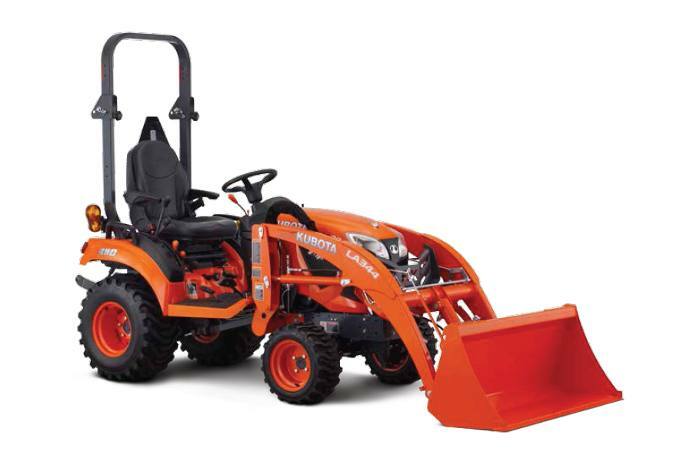 Kubota Performance Matched - The BX80 Series is built by Kubota, for Kubota, it's not a re-branded product built and distributed by multiple manufacturers. Metal Hood and Fenders - Strong and durable metal hood and fenders will not only protect your equipment, but will keep your BX80 looking good for a long time to come. Full Opening Hood - Allows for quick and easy access to your engine maintenance items. Kubota HST with 2-Range Transmission - Smooth and dependable HST Transmission with an easy to use range selection to optimize power output to meet your needs. *SAE J1995 **The loader and backhoe come standard on the BX23S model.